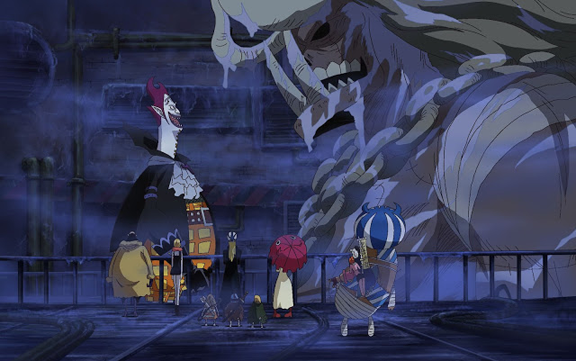 The straw-hats are back with a spooktacular adventure, as our favourite pirates arrive at the notorious Thriller Bark. 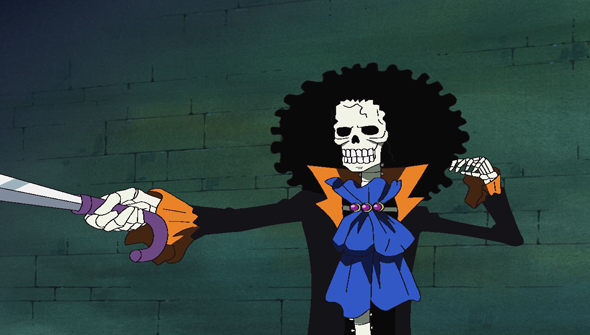 When they come across an abandoned ghost-ship they encounter Brook, a talking, afro-sporting, sharply-dressed skeleton, who recounts to them his sad story. This leads them to Thriller Bark, the giant floating castle/ship that gives its name to one of the most popular story arcs of One Piece. Once inside they encounter an army of zombies and other strange and spooky creatures. Just what is the secret of this mysterious place? This review covers episodes 325-372, which comprises One Piece Collection 14 and Collection 15 of the DVD releases from Manga UK. The episodes originally aired in Japan between October 2007 and September 2008. Before encountering Brook, however, the crew have to contend with a new threat, in the form of a family of assassins. Although these are filler episodes, the new characters are memorably bizarre and they provide plenty of entertainment value, with laughs and action aplenty. We also meet another band of pirates, left reeling from the defeat of their captain. Their story and predicament brings a sense of pathos to proceedings. These episodes may be inconsequential and do nothing to advance the overall plot, but they are also somehow pure One Piece. This storyline doesn't outstay its welcome and it's not long before the crew have their first meeting with Brook. And what a wonderful creation this "gentleman skeleton" proves to be. The combination of his particularly dapper personal style (complete with top-hat and suit) with that afro and his habit of cracking Dad-jokes ensure that he comes close to stealing every scene he features in. 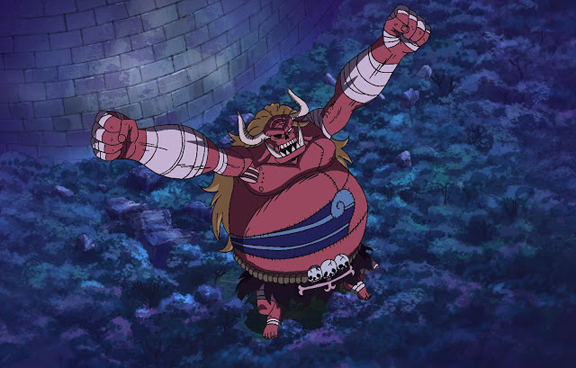 He's a typically larger-than-life character from creator Eiichiro Oda, and among his very best. And of course- as is usually the case in One Piece- he comes with a typically tragic backstory. In this case, it even ties neatly into a memorable moment from earlier in the series. The majority of Collection 14 (and the entirety of 15) takes place within Thriller Bark itself. 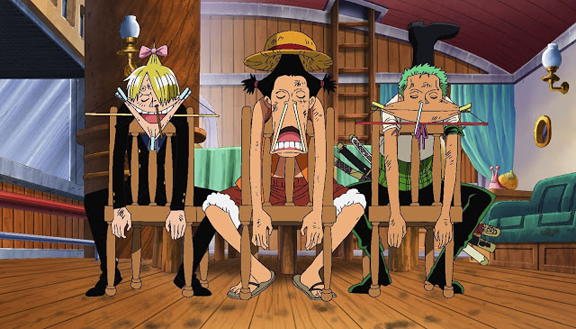 One Piece has never allowed its nautical theme to restrict it creatively and has taken in a wide variety of settings, from the desert kingdom of Alabasta to the fantasy world of Skypeia. Similarly, this new location is not what you might expect to find in a pirate series. The whole arc has a classical horror influence, with the ship containing a castle you might expect to find in a Transylvanian village in an old Universal monster movie. The presence of a zombie army, giant beasties, and a Frankenstein-style mad scientist only reinforce the gothic feel of the whole affair. This being One Piece, of course the zombies are not quite what they first appear. One of the chief mysteries of this particular storyline is the appearance of zombies that appear to have the personalities of members of the crew. I won't spoil the secret behind the true nature of these apparently undead assailants, but suffice to say that when the twist comes, it proves to be particularly inspired. This arc does, however, feature a sequence that has to be the most blatant piece of fan-service that has appeared in the service to date. There is definitely a difference in the way the series depicted its female characters in the earlier episodes to more recent ones, and the sexualisation is much more overt than it used to be. This is still One Piece, so it's nothing too raunchy, but it did still stand out as something it would have been hard to imagine being in the series in its earlier days. If you've been following the series this far, you'll know that the quality of the animation itself can be rather variable. It ranges from decent enough to at times barely adequate but the show itself is so entertaining, that you rarely notice. This is par for the course in long-running anime, unfortunately. Following the epic Water 9 arc, the Thriller Bark plot is a nice change of pace. Although it provides the requisite thrills and spills and some dramatic moments, this is also perhaps the most consistently out-and-out funny the series has ever been. A fair part of this can be put down to the presence of Brook (and another character named Oars we encounter later) but there's plenty of laughs to be had here. One Piece has managed to stay entertaining for well over 300 episodes with few missteps. Still, it's pretty remarkable that it can still deliver surprises this late in the game. This is One Piece firing on all cylinders, and delivering one of its very best arcs to date. So much fun... it's spooky!